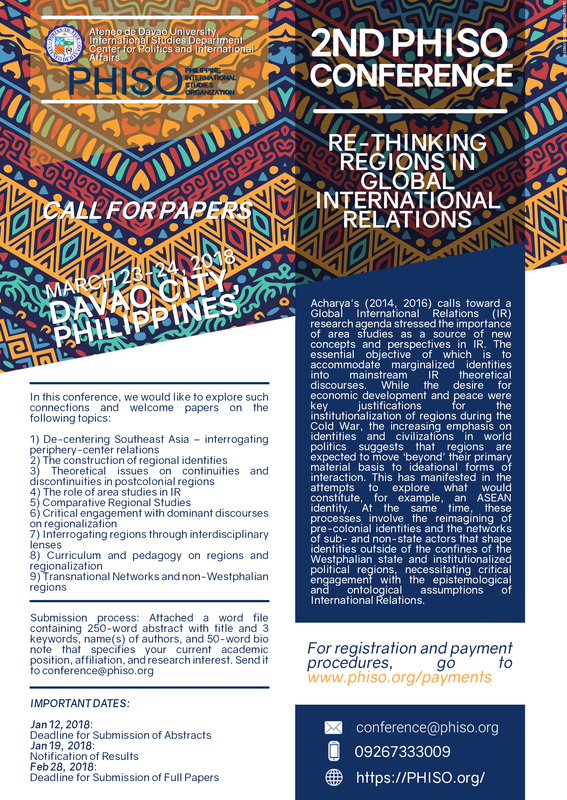 Please take note that we consider all papers on International Relations/Studies and interdisciplinary perspectives on regionalization. Click here for the list of distinguished speakers. Submission process: Attached a word file containing 250-word abstract with title and 3 keywords, name(s) of authors, and their 50-word bio note that specifies their current academic position, affiliation, and research interest. 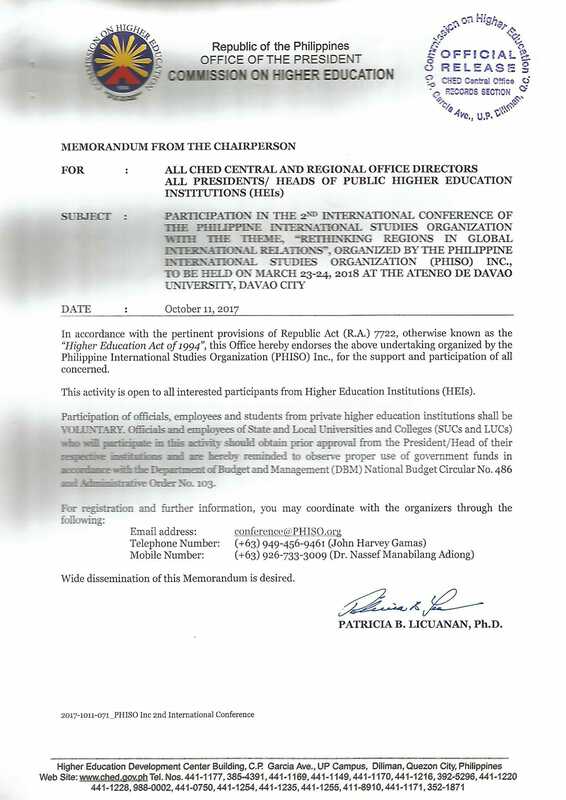 Send it to conference@phiso.org. Submission of abstracts is due on January 12, 2018. Notification of results is on January 19, 2018. Submission of full papers is due on February 28, 2018 extended on March 15, 2018. Click here for the call for chapter and book proposals for the 1-day (March 22, 2018, i.e. Thursday) exploratory workshop on “International Relations in Southeast Asia” book series. – Additional PH₱300 (or US$6) for PayPal payments, if selected. Incomplete payments sent through PayPal will have to be completed onsite in Philippine Peso. – Additional bank charges, if any, must be paid by the participant. For payment procedures, click here. After payment, please send us a confirmation email with your name and its receipt to conference@phiso.org. It is possible to attend the conference without presenting a paper as long as registration is fully paid. It will give you access to all presentations, coffee breaks and programme related activities. Click here to get a copy of the CHED endorsement. For logistical information and accommodation near the university, click here. The final programme will be available in early March 2018. Unfortunately, no conference, travel or accommodation grants are provided for both domestic and foreign participants. Kindly be reminded that non-presenting participants who plan to register as walk-ins on the 23rd and 24th may avail of the rate of PH₱2000 which includes the conference kit, ID, access to panels and refreshments. Additional food stubs will unfortunately no longer be available for those with late registrations at the time of the conference due to logistical reasons. 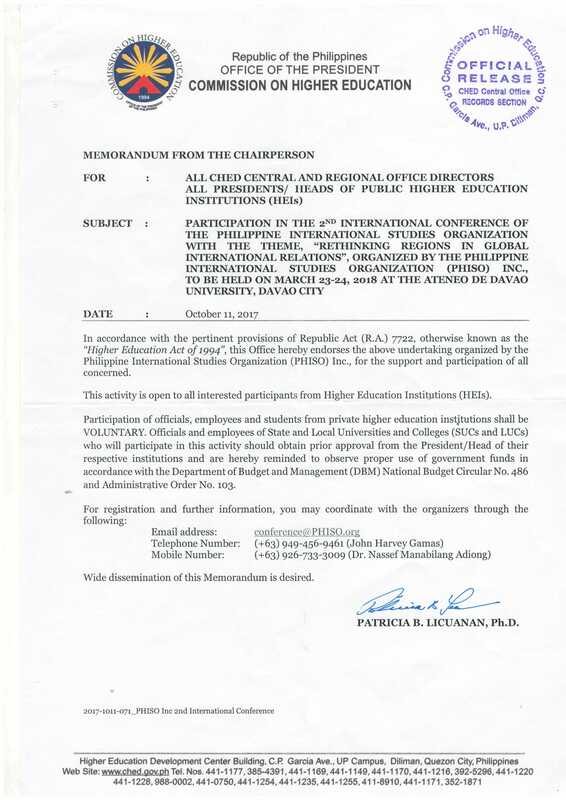 Non-presenting walk-in participants may avail of the various food establishments within and around the Ateneo de Davao University. We thank you for your understanding and look forward to see you at the conference! For inquiries, email us at conference@phiso.org, call/text +63.926.733.3009 or mail us at #5 P. Zamora St., San Isidro Village 1, Concepcion 1, Marikina, Metro Manila 1807 Philippines. PHISO is very thankful to ISA and IPSA for helping us disseminate the conference’s call for proposals. International Studies Association’s announcement is available here, while International Political Science Association’s announcement is accessible here.